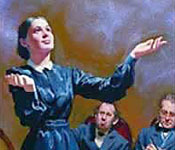 Robert K. Sanders alleges that Ellen White contradicts the Bible more than 50 times. The following is #28 from the revision of his document dated June 2002. EGW: SATAN "It was seen, also, that while the sin offering pointed to Christ as a sacrifice, and the high priest represented Christ as a mediator, the scapegoat typified Satan, the author of sin, upon whom the sins of the truly penitent will finally be placed. ... Christ will place all these sins upon Satan, ... so Satan, ... will at last suffer the full penalty of sin" (Great Controversy, p. 422, 485, 486). 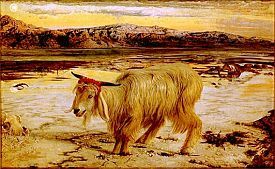 The scapegoat in the wilderness, by William Holman Hunt.—www.victorianweb.org. The first thing we notice is that the Bible verse Sanders gives, though talking about the cross, does not use the word "scapegoat." Might there be another verse that Sanders could use that would explicitly say that the scapegoat is Christ? We honestly don't know of one. The quotations from Ellen White as given by Sanders do not say anything about Satan "bearing" anyone's sins. Though her paragraph does use the word "bearing" twice, Sanders doesn't quote that part, which seems odd. If Sanders had quoted the entire paragraph, he might have made a stronger case. Thus, when someone fails to warn someone else about their sins, he becomes guilty of those same deeds, and must pay for them. In human courts of law, others than the perpetrators of a crime are at times found guilty too, and are punished for deeds they knew about but never did. It should then not surprise us if God's justice likewise demands some sort of accountability and punishment for those who knew but kept silent. Yet here is a key point: While such individuals must pay the price for the sin or crime of another, the price they pay does not make them a savior or substitute for the actual perpetrator. It is only the price paid by a guiltless substitute that can buy one's pardon. Thus, even if Satan at some point in the future does bear the sins of others, he, the guiltiest of all, can never be a savior or a substitute. Only Christ the Guiltless One can fill that role. At this point, we haven't found how Satan being punished for the sins of others contradicts Scripture, since as we have just seen, there are occasions where one sinner becomes guilty for the sins of another sinner. Proclaim remission of sins through Christ, the only Sin-bearer, the only Sin-pardoner. Proclaim the remission of sins through repentance toward God and faith in Christ, and God will ratify your testimony.—The Voice in Speech and Song, p. 340. Thus, while Ellen White believed that Satan, as the scapegoat, would bear the guilt of the sins of the redeemed at the very end of time, and would be punished for them, she did not believe that that made Satan our sin bearer or sin offering or savior or substitute. Frankly, whether we like it or not, we have to admit that this detail of Ellen White's teaching agrees with what we discovered in Leviticus 19:17. There are occasions when one must pay for the sins of others, but that does not turn one into a savior or substitute. In the typical service the high priest, having made the atonement for Israel, came forth and blessed the congregation. So Christ, at the close of His work as mediator, will appear, "without sin unto salvation" (Hebrews 9:28), to bless His waiting people with eternal life. As the priest, in removing the sins from the sanctuary, confessed them upon the head of the scapegoat, so Christ will place all these sins upon Satan, the originator and instigator of sin. The scapegoat, bearing the sins of Israel, was sent away "unto a land not inhabited" (Leviticus 16:22); so Satan, bearing the guilt of all the sins which he has caused God's people to commit, will be for a thousand years confined to the earth, which will then be desolate, without inhabitant, and he will at last suffer the full penalty of sin in the fires that shall destroy all the wicked. Thus the great plan of redemption will reach its accomplishment in the final eradication of sin and the deliverance of all who have been willing to renounce evil.—Great Controversy, pp. 485, 486, bold added. Notice how Ellen White said that Christ our High Priest is the one that carries or bears our sins, and that in this capacity He places them on Satan at the very end of time. Thus, once again we see that she is careful to identify Christ as being our High Priest, our Sin Bearer, and our Savior. When Do the Sins Get Placed on the Scapegoat? Notice that the goat for Azazel, the name of a fallen angel in the Book of Enoch, has the sins put upon him only after the high priest has "made an end of reconciling." Since the Hebrew word for "reconciling" is also the same Hebrew word translated 15 times in this same chapter as "atonement," this means that the sins are only put upon the scapegoat after the end of the atonement. The high priest represents Jesus. Whom would Jesus put the sins of God's people upon after He has finished the atonement? Himself? Why would He need to do that? There is absolutely no need for Him to place sins upon Himself after the atonement is finished. At this point we find Ellen White's idea that the scapegoat represents Satan to be far less troubling than the thought that Christ's atonement was somehow incomplete. In order for Sanders to be correct, Christ must place sins upon Himself after the atonement is over, and pay for those sins yet again as the scapegoat. Why Would God Punish Satan for the Sins of Others? That question needs an answer. Can we find one? In some way the redeemed, God's saints, are honored in having a part in the bruising and breaking of Satan. In what way could this prophecy be fulfilled? 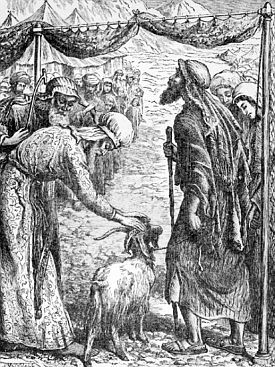 Ellen White makes one suggestion: After the completion of the atonement, the sins of God's people are laid upon the old goat, and he is punished for those sins. Perhaps Sanders has another suggestion. If so, we'd be open to hear it. "Azazel, a word found only in the law respecting the day of atonement. Lev. 16:8, 10, 26. . . . it seems to denote an evil demon dwelling in the desert and to be plac[at]ed with victims . . . . This name Azazel is also used by the Arabs for an evil demon." The imperial ensign. "—Paradise Lost, book 1. —J. N. Andrews, The Judgment, Its Events and Their Order, pp. 78-81. Looks like, even if Ellen White were wrong on this one, a pretty good case can be made to support her position on the scapegoat. "Satan Bearing Sins": What do you think? Sanders is right because Christ's atonement is definitely incomplete. Jesus has to place sins on Himself after the atonement is over. Ellen White was probably right that the scapegoat is Satan. Christ doesn't have to pay for sin after He has finished the atonement. It doesn't bother me a bit if God holds that old goat responsible for all the sins of the redeemed. He's got it coming to him. I've never heard these ideas before. I need to study, think, and pray about this before I know what I believe on this one.